Sagittarius + Capricorn Rising + Scorpio Moon. Year of the Rat. Life Path 6. Cybele’s Mom. 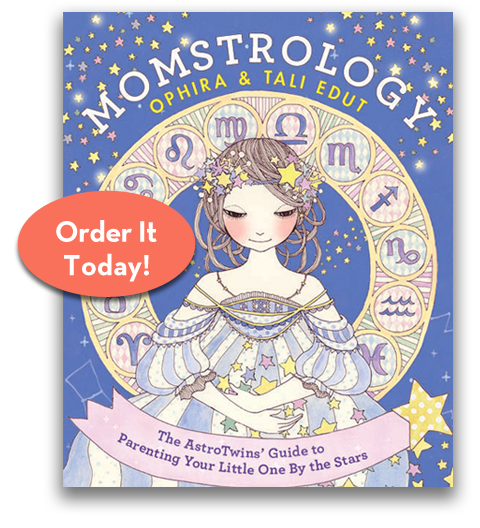 Hi, I’m Ophira (Ophi, for short), one-half of The AstroTwins, and a proud mom and stepmom. In 2007, I married my husband Jeffrey and became the “bonus mom” to Clementine, a Leo born in 1999. Although I wasn’t sure I’d have my own kids, Clementine won me over, becoming a junior astrologer and even picking out my wedding dress. In October 2010, my Libra daughter Cybele was born, sealing my fate as a mama. While reconciling my identity as a mother with my pre-mom self is an ongoing journey, I’m excited to have a forum to explore that—-and to help other moms realize that it’s okay to be a messy, complex human. Families really DO need to come with an instruction manual, and I’m psyched that our 600-page book Momstrology and this site can provide a road map. Lord knows, I need one, so I guess we’re teaching what we need to learn. My passion has always been using astrology to help people create healthy, happy relationships where difference are respected. That doesn’t always happen in families—at least, not without a multitude of tools. (As I always say, friendship is based on chemistry and family on biology.) Motherhood may be one of the toughest gigs, but the job can be easier when you understand the dynamics and needs of your child’s sign–and your own. It’s like cooking a dish that’s never done and always needs new ingredients. Somehow, I’ve found myself at the stove, trying to figure it all out. In my non-cosmic life, I split my time between New York City’s East Village and a quirky little town called Nyack. When I’m not writing horoscopes or doing private readings, I can be found singing karaoke, promoting positive body image (through my site AdiosBarbie.com), chasing my two feisty dachshunds and finding new places to eat. Sagittarius + Capricorn Rising + Scorpio Moon. Year of the Rat. Life Path 6. I’m Tali, the other half of The AstroTwins, a Sagittarius and a “savvy auntie” to Cybele and Clementine. Which means (bonus!) I have the leftover brain cells to teach Clementine how to make bedazzled T-shirts and stand in as “stunt double mom” when Ophi is too tired. (However, Cybele isn’t fooled—she can tell her twin mama and aunt apart.) A quirky fact: I psychically experienced all of Ophi’s pregnancy symptoms, while she had none! So yes, I guess twins can be telepathic. I’m currently living the bicoastal dream, dividing my time between New York City. I spend my West Coast time with with my husband Cory, who owns a vintage Polaroid store and art space called Rare Medium. I’m an avowed karaoke fanatic, and I’m proud to find that my nieces have already taken a shine to the microphone, too. Pisces + Virgo Rising + Leo Moon. Year of the Ox. Life Path 1. Jackson’s Mom. Beach bonding water signs; mama time; Jackson and Taurus daddy Dave. I’m a passionate, creative, overthinking Pisces who spent (too many?) years wondering if motherhood would suit me. The universe answered on July 4, 2009, when I delivered a Cancer son, Jackson, whose firecracker personality is worthy of his Independence Day birthday. Despite my varied and successful careers—as a newspaper reporter, a dotcom editor, a healthcare publishing executive editor—I’d finally found my life’s calling as a nurturer (hello, remember I’m a Pisces?). Giving endless hugs and kisses, playing dinosaurs, making arts&crafts, and traveling as far as the budget allows (water sign; beach please) are what I live for now. Thanks to Jackson’s daddy, my adoring, feet-on-the-ground Taurus husband, Dave, I’m able to do these things and write about them. When I’m not being a “just” a mom, I’m most likely watching a Law & Order marathon, rocking out at an 80s glam rock concert, reading a classic, or honing my skills as an astrology apprentice to The AstroTwins. Thanks to these three ladies for helping us launch the original Momstrology site. They set up and nurtured our Pinterest and social media, wrote articles, brainstormed and helped give birth to this idea.